I’ve had a fantasy about living in a small Mexican town and immersing myself in the daily rhythms and rituals. Would I feel safe? Would I have fun? Would I hide out in my rented apartment? Or would I venture out into the plaza and get to know the people? Would I make friends? Would I finally master something beyond the present tense verbs of the Spanish language? I love Mexico, and want to feel safe as a woman traveling beyond the border. I want to check out those incredible beaches along the Sea of Cortez; I want to sit in a cantina overlooking a plaza and listen to soft guitars strumming the old love ballads, sipping a tequila. But, it’s complicated. As a country, we are caught in a warm, but menacing embrace with our neighbors to the south. We love the food of Mexico. Oh my god, do we love the smells of real Mexican cuisine with a chaser of ice cold Mexican beer. We love the drugs, and spend billions smuggling them into our country. Then we spend billions on a wall and on law enforcement keeping them out. We are crazed with the militarization and polemic of keeping our borders secure. And yet dope is cheaper and easier to obtain in US cities than twenty years ago (or so I’m told). The collateral damage of the war on drugs has done more harm than the drugs themselves. 80,000 are dead in Mexico as a direct result of the drug wars. I see the collateral damage weekly at el comedor when I talk with migrants heading north, or recovering from a stint in the Florence Detention Center. Our films and music have a strong Latino flavor. Our homes are decorated with images of the Virgen de Guadalupe and colorful rebozos and serapes. We spend a fortune on remodeling our bathrooms and kitchens with Mexican tiles and marble. We are so connected with Mexico, and so hypocritical in our actions. My family and friends employ Latinos to care for their children, clean their houses, tend their gardens, and wash their dishes. I have personally hired housekeepers to help with the clean up of our ranch house. Always they were hard-working Mexican women. I have a friend in the restaurant industry in New York City. He tells me that the industry would collapse overnight if the Mexican workers were to walk out. Especially the undocumented. He cannot afford to hire workers with a Green Card, and is only able to keep his three restaurants alive by hiring the undocumented, paying them slightly above the minimum wage. Often he has sponsored them on the long and arduous path toward citizenship. The same goes for the hospital industry. Latinos care for our sick and elderly, and we are lucky to have them at our bedside. They pray for us and care for us as if we were their own family. If I have a flat tire at the side of the road, it is invariably a Mexican family in a dented pickup truck that stops, offers to change my tires, and shares some warm tortillas and water with me. 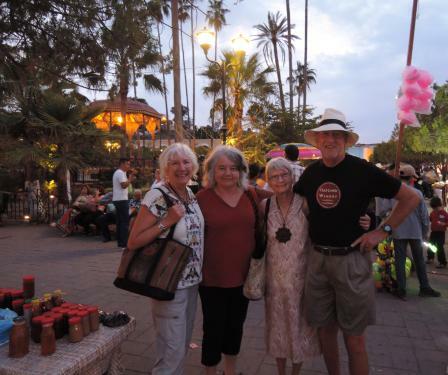 I plunged into a journey into Mexico during the month of April with a woman friend, Trudy, from Buffalo, New York. Oh my, how she wanted to get out of the cold and sleet of Buffalo. 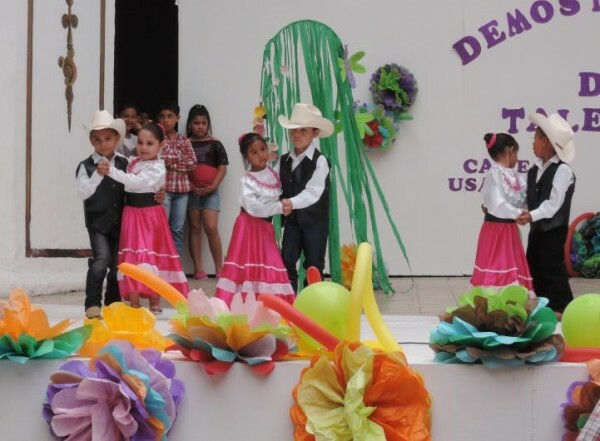 I wanted to dig deeper into Mexican culture and get away from the border. We drove down to Alamos, Sonora, Mexico, an old silver mining pueblo about nine hours from the Arizona border city of Nogales. As a teenager I had visited Alamos with a church group from Tucson. I never forgot the charm of this city, and decided to return. My Buffalo friend was up for the adventure, not quite sure what she was getting into. But she was sure the temperatures would be warmer than Buffalo. 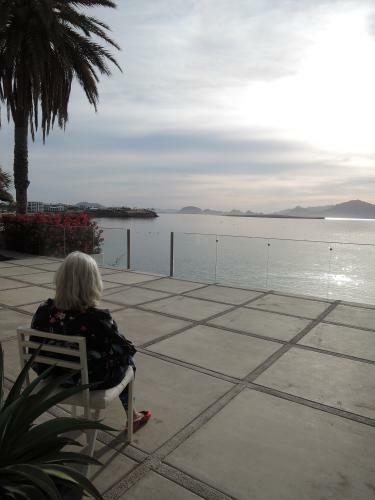 We drove to San Carlos, the first leg of the journey, and stayed in the home of a friend who has a lovely getaway residence on the Sea of Cortez. San Carlos is an easy 4 1/2 hour drive from the Nogales border. The highways are well maintained and the scenery is quite beautiful. The beaches and coastline of Mexico rival anywhere in the world. The water was blue, the dolphins were jumping, and our time in San Carlos was idyllic and peaceful. 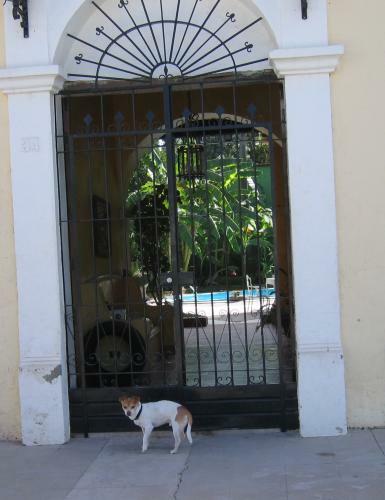 Then we headed off to Alamos and our rental house that I found online. On the way we passed up the immigration car registration office (poor signage) outside of the small town of Empalme and had to stop, ask where the office was, and were graciously redirected to the correct office, doubling back 20 miles. We needed a sticker for the car because we would be in Sonora for a month. Occasionally we misread road signs and got lost, but again, were kindly pointed in the right direction. We were two female septuagenarians wending our way through cities and countryside in a foreign land, and we never felt afraid. Confused, yes. Exasperated at times, yes. But never afraid. 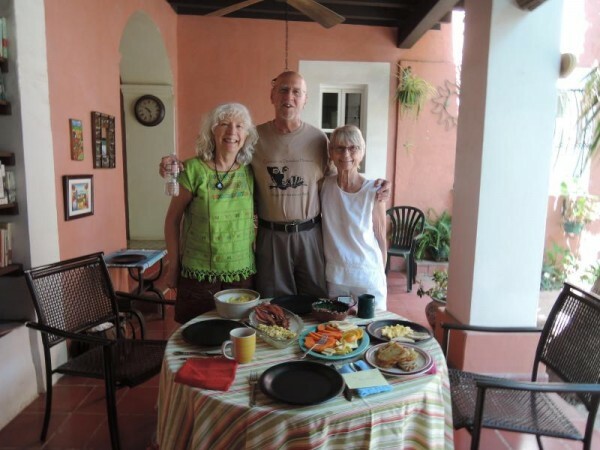 Arriving in Alamos we were delighted and amazed with our accommodations. 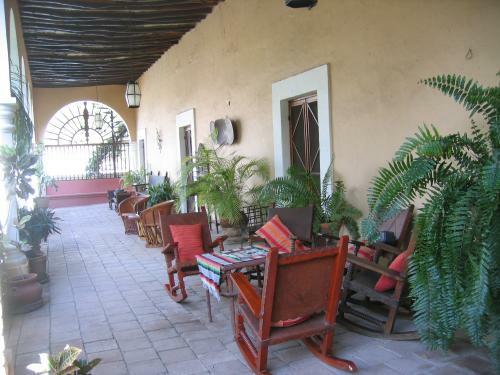 Our house was built in 1720 and was lovingly restored, with adobe walls that were two feet thick. The interior was twenty degrees cooler than the outside temperatures, which some days topped 100 degrees. There was a substantial library, comfortable beds, a colorful, well-stocked kitchen, and wooden shutters on the windows that blocked out the heat of the day. All rooms (and there were a lot of them) led to the central courtyard where we were dazzled with a lush garden and bubbling fountain. 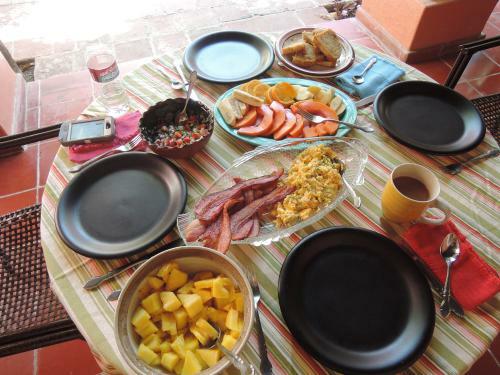 We took our afternoon siestas in the courtyard and ate our meals at the patio table. We invited friends from Arizona to join us, Samaritan Jaime and his wife, Barb. 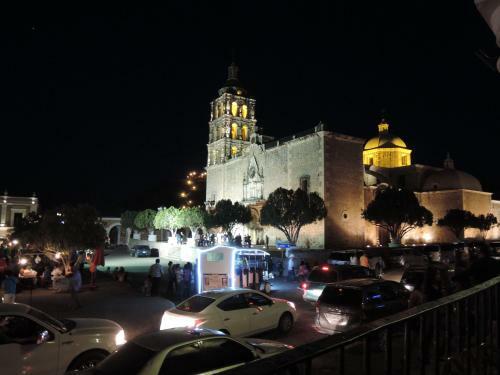 Our new home was one block from the central plaza, the social center of Alamos. A beautiful stone church graced the plaza gardens, and bells pealed each day for morning and evening mass. Easter was a four day religious festival, with processions, flowers, music, and vendors on the plaza. Thousands came from out of town for this celebration. 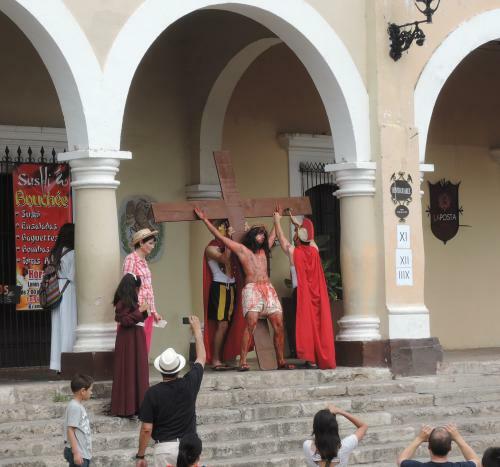 Good Friday brought parades of silence and solemnity, and an enactment of the crucifixion on the plaza (in front of a sushi restaurant and cantina). Fake blood, Roman soldiers, and a young man portraying Christ nailed (make-believe nails) to the cross completed the scene. The silence and respect among the spectators was impressive. Merry making and loud music were juxtaposed with absolute silence when the passion of Christ was portrayed. 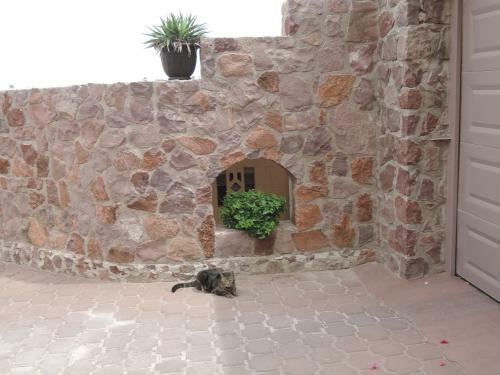 In fact, during our four weeks in Alamos, we never witnessed loud, drunken, obnoxious behavior. The cantinas and bars were places for families, with children and dogs running about. Music was everywhere. Men were out on the street in the early morning hours sweeping, and picking up trash and dog poop. The streets were immaculate in spite of the large throngs of people during semana santa. 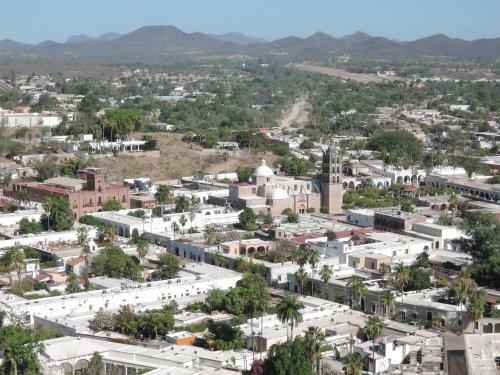 (Holy Week) The middle class is strong and thriving in Alamos. One night we were strolling home from the plaza. An old man with his walking stick slowly approached us on a narrow side street. His cowboy hat, jeans and sandals were silhouetted in the moonlight. He was hunched over his walking stick, moving with a slight limp. Singing in full voice an old Mexican ballad, he passed us by, never missing a beat as he meandered home, savoring the softness of the night. It was like a sweet dream of Mexico. And it was real. On another walk through town we saw a woman sitting on the curb with her husband beside a ancient, beat-up truck. It was late in the evening, and their CD player was cranked up high echoing through the narrow street. Luciano Pavarotti was singing a classic aria from the opera, La Boheme. Tears were streaming down the woman’s face. 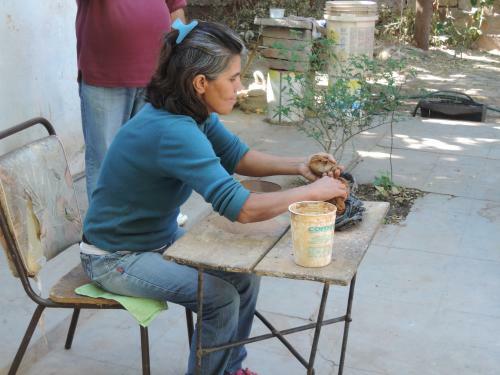 She was a Mayo Indian, an indigenous person of this region, and was an excellent potter. I stopped to listen to the music, and she looked at me and exclaimed, “Isn’t this the most beautiful music you have ever heard?” She wiped her eyes self-consciously, and invited us to join her in listening to opera. 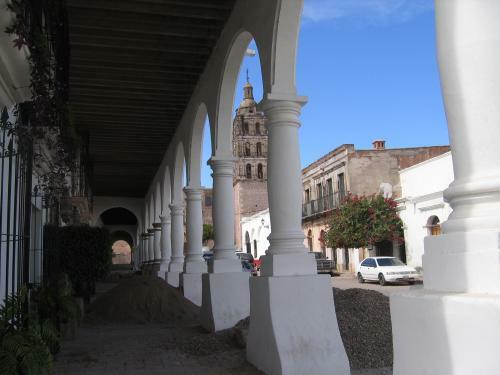 Alamos is known for its expatriate population, and many Americans have settled here restoring some of the old colonial architecture. We rarely saw them. My friend and I were the only gringas at the mercado shopping for our food, and Americans were conspicuously absent on the plaza and the surrounding streets. After a week everyone knew where we lived, where we shopped, and noticed that we loved to frequent a certain restaurant for an afternoon cafe latte and pastry. Our white hair was a flag that stuck out like a sore thumb. We discovered a special shop that sold only pork, raised and cured by the proprietor. I gestured with my fingers how thick I would like the bacon, and the butcher sliced the pork, always throwing in an extra slice or two. We feasted on the best bacon I have ever eaten. No chemicals or preservatives. The real deal. And I don’t particularly like bacon, but this was a whole new genre. 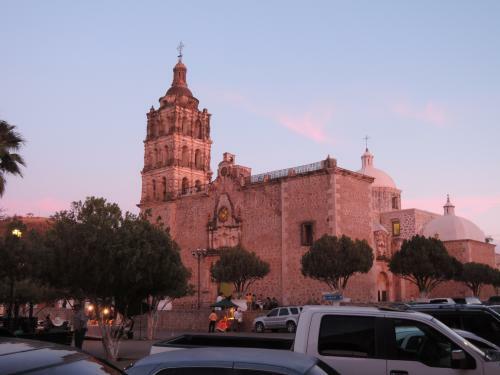 The longer we stayed in Alamos, the more we peeled back the layers of this magical city. The town is self-sustaining. Few people leave or migrate north. There is poverty in Alamos, to be sure, but it is not readily visible. I noticed that several nonprofits gathered and prepared Easter baskets for the poor, with cans of food, diapers, toilet paper, and other essentials. I saw no one begging in the streets. The children played endlessly in the plaza with parents watching and snapping pictures with cell phones. The kids played circle games and stick ball. There were no video games or fancy battery toys. They played until they dropped, reminding me of my own childhood when I played outside with friends well after dark. I attended a spring talent show for elementary school children, with a line-up of judges much like the TV show,American Idol. The children danced, sang songs of spring and true love, and the auditorium was packed with proud parents. Toddlers crawled beneath the folding chairs; dogs wandered in and out; mothers sold cups of papaya, pineapple and jicama with lime and chile powder sprinkled on top for the hungry audience. I wanted to study Spanish during my Alamos visit. Dropping in at the local Tourist Office, I asked the receptionist about local Spanish teachers. She said, “If you like, you can just drop in here for an hour or two every day, and I’ll talk with you in Spanish and be your teacher.” So I did. Danitza was an excellent teacher; she assigned homework, pushed me into conversations using past tense verbs, and took me to community events where there were lots of people ready to converse. I met her six year old son, Ricardo, and learned of the school system and quality of education. I still struggle with future and past tense verbs, and those reflexive verbs still stop me cold. But by the end of the month my Spanish improved dramatically. On our last night in Alamos, we discovered a restaurant, Doña Lola’s, that rivaled all the food we enjoyed during our month long stay. Finding this place was a challenge. It was at the end of a small narrow alley, and it was dark. With no street lights, we followed the sounds of music, mincing along on the cobblestone street. Sitting on a streetside curb, a group of men and women were singing in the moonlight, strumming a couple of guitars. Children were playing stick ball although no one could see the ball. A couple of dogs were nosing around looking for scraps. The restaurant had one small sign barely visible to us, as there was only a dim light bulb announcing this establishment. We saw ladies chopping vegetables in a small kitchen area, and figured this must be the place. We climbed up a steep cobblestone staircase and entered a faintly lit room with long tables covered in brightly colored oilcloth. The place was empty, as 7 PM is early for a Mexican supper. Ushered to a table, we were treated to fresh tortilla chips and the best salsa we had anywhere. And then came the most outstanding Mexican food of our Alamos visit—perfect fluffy chile rellenos, enchiladas, herbed rice, pinto beans, and a chicken soup. The ladies bustled around us in flowered aprons as we inhaled their offerings. Some meals you don’t forget. This was one of them. The ladies packed us a special bag of chips and salsa for our trip home. I think both meals plus chips and salsa came to $12 total, mas o menos. Once again I settled back, sipped my drink, and marveled at what a wonderful country Mexico is. The soft music, the kids playing stick ball way after dark, and the Alamos hounds quietly prowling the streets minding their own business—all of it evoked a simple, deeply restful way to live a life. I wanted to take a piece of this special night and plant it back in southern Arizona. I wanted to stay in Alamos and write a great novel (in Spanish–yeah, right), and paint some watercolors worthy of this beautiful place. I wanted to take the parts of Mexico that I love and somehow integrate them into my life in Arizona. I am a dreamer. And I can hope. Thank you Bill and Jeannie for the respite in your beautiful San Carlos home. If you wish to receive regular postings (usually once/month) to this blog, register in theAnnouncement List space in the right-hand column, and you are automatically on the email blog list.